And this is also good time to remind the Oceania zone kendo ladies that it’s not too late to register to attend the seminar! The seminar instructors, Kanzaki and Abe sensei are both outstanding kendo 7 dans, visiting from the Osaka area to help develop our kendo further. Previous seminars were extremely well received, so don’t miss out. The locals can help you with accommodation too! 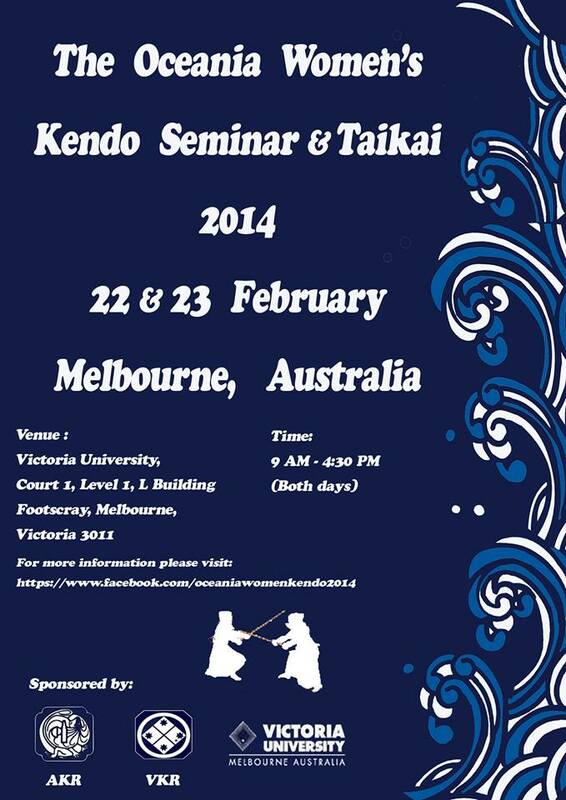 It is with great pleasure announce the 3rd Oceania Women’s Kendo Seminar and Taikai to be held in Melbourne on 22 and 23 February 2014. We are very fortunate to once again have the vastly experienced Satoko KANZAKI Sensei (Kendo 7 Dan) and Tokiko ABE Sensei (Kendo 7 Dan) lead this seminar. The 2011 and 2013 seminars were a great success with more than 40 women participating. We encourage female kendo practitioners of all levels to participate in this event. Please mark these dates in your diary. More information regarding this event will be distributed in October. We look forward to seeing you all in Melbourne in February 2014! Got a question or want to register now? Please use the relevant form below.